Neal and I just returned from a trip to Montana. We went there to escape the summer heat of Alabama only to find that we had taken the extreme heat with us. Everywhere we went, the locals kept telling us “it is never this hot here.” Such is our luck. We still had a marvelous time exploring the area, though. 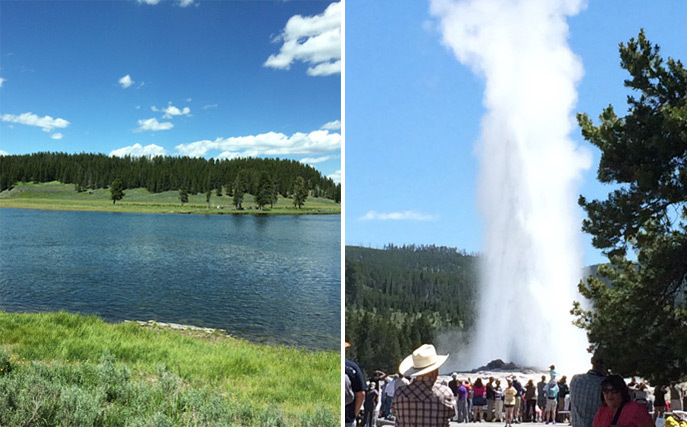 A few snapshots I took along the way: The scenic Gallatin River, and Old Faithful at Yellowstone National Park. There is nothing that can describe the magnificent mountains and the rivers that undulate around the terrain. I loved watching people fly fish in the Gallatin River and the young people floating down the river on inner tubes. They were having such fun. 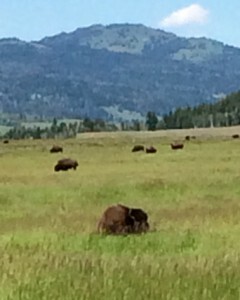 Spotting wildlife, like this herd of bison, was among the highlights of our trip. We took a day trip to Yellowstone National Park in Wyoming, where we were delighted to see Old Faithful shoot steam many feet into the air. Apparently it is so regular you can almost set your watch by it. People were gathered by the hundreds every time it erupted. We loved the wildlife; it was baby bison time. You really had to watch as people would slam on brakes and come to complete stops in the road whenever there was a bison sighting. The elk were beautiful and seemed to put on a good show for the tourists, especially when they were grazing right in the center of town. But there was a respect for the wildlife and their beauty—you just had to keep some distance between you and the animals. In Bozeman, Montana, we found a cowboy steakhouse (which delighted Neal) and a lovely quilt shop (which stole my heart). We have made a pact to explore our country and really take in the beauty of the United States. If you have never traveled to the West, then you might want to consider taking a trip there. Where would you recommend we travel? Tell me about your favorite vacation spots! Ah….COLORADO! I have been in all the western states, but nothing compares to COLORADO, in my opinion. I how live in Arizona, but really miss the awesome beauty of the COLORADO mountains, especially near Estes Park and Rocky Mountain National Park. In COLORADO we have seen herds of over 300 elk, and also snow in the mountains, even in July and August. And the trout fishing is fantastic! I suggest you give this beautiful state a try on one of your western trips. How wonderful that you enjoyed my beautiful state! Yes, I am a native Montanan and now live in Missoula. Many years ago, I lived in Bozeman. It is a lovely place…in the summer. However, winter is serious business. Perhaps, the next time you visit, you will consider the Bitterroot valley. All the little towns along highway 93 are charming. The North Rim of the Grand Canyon is beautiful. It doesn’t have the large number of tourists that visits the South Rim. It is only open during the summer months. Post Script-go to your library and get Ken Burns series on National Parks-it will inspire you to a whole life of new adventures. I love Montana. Glacier National Park is gorgeous! We drove across Montana many years ago, and took a side trip to Yellowstone National Park. We pitched a tent and camped in the snow in June!! I would recommend you come to the Seattle area, see the sites others have suggested, but add Deception Pass State Park. Take the Victoria Clipper through the San Juan Islands and visit Victoria, B.C. Canada, When you return to Seattle, hop on a cruise ship to Alaska.for spectacular scenery. Since I have lived in Wisconsin for almost 30 years I may be a little prejudice but I highly suggest two of many places to visit in this state. One is Bayfield in the far north of the state on Lake Superior – the other is Door County on Lake Michigan. Both are fabulous and have much to offer including relief from the heat and humidity of the south. Attractions at both places are too numerous to mention. Mackinac Island and Northern Michigan. I read about Harbor Springs in an old issue of Victoria and had to visit! It is delightful! Highly recommend for summer travel! Somewhere in Time was film at Mackinac Island and I have always wanted to go there for a visit! My husband and I spent our wedding trip at The Grand Hotel which was the setting for Somewhere in Time. Few places are as beautiful. I have been to Mackinac Island many times and plan to return. The bike ride around the island is fun and be sure to take the horse and wagon trip through the middle of the island. Explore the middle of the island and see beautiful views when you are up high. Try visiting Luray Caverns in Virginia. You will stay cool and it really has some interesting formations…like a rock that looks like two fried eggs. Visited Yellowstone with my son and 2 grandchildren last fall. The weather was gorgeous in September (seems to be a great month to travel anywhere) We stayed at the Old Faithful Inn, which was a highlight for me. You have to book reservations about a year in advance if you want to stay there. I live in Utah and have a couple of recommendations. If you have never been to the four corners region of our state, you should plan to visit. We have Canyonlands and Arches National Parks. Many people visit Moab to river raft and jeep. Durango Colorado (about a 3 hour drive from these other attractions) is a fun tourist town. You can stay at the Historic Strater Hotel and take a train ride from Durango to Silverton, where you will see much in the way of gorgeous scenery. You could also attend the Bar D Chuckwagon supper and comedy show for a feel of the old west. Telluride (ski resort village) is within a reasonable drive, also. Last recommendation: If you visit the Seattle area, take the ferry out to the San Juan Islands. San Juan Island (the biggest) is my favorite. Sometimes you are lucky enough to see killer whales from the ferry. You can also rent small motor boats or kayaks to explore the area. We will in Bozeman the end of September after spending a few weeks in Jasper and Banff, Alberta, Canada and Glacier National Park. Could you tell me / us the name of the steak house and the quilt shop, please, so we don’t miss them. Thanks. A favorite of my husband and I has always been Jackson Hole, Wyoming. We took our children many places in the U.S. and abroad to give them a flavor of the world. 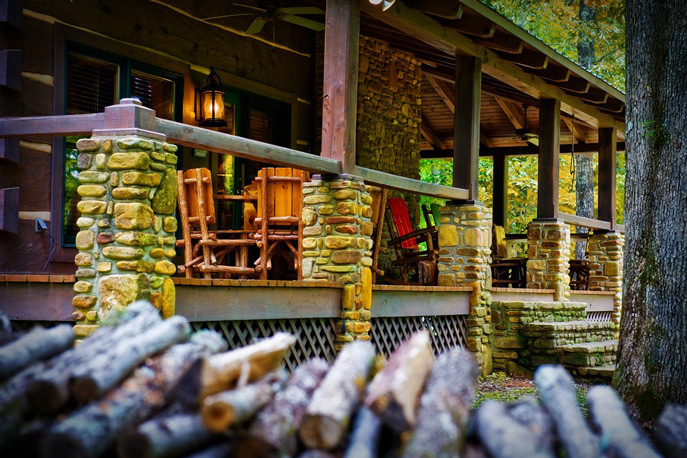 I still go there with my children and grandchildren who all love it because it is apart of their “vacation heritage”. The Tetons are so spectacular. We went many years ago and after a few years, I got lonesome to see the Tetons again. It is difficult to really internalize the grandeur and beauty enough to last forever. Now and then I just need to see them again. We are a blessed people to have such beauty in our own country and be able to travel anywhere we wish, anytime (as long as we can afford it!). There are, however, may economical ways to travel….and all interesting and educational. Montana is great too….I remember thinking “now I really know what it means when someone says “big sky country”. May we enjoy our blessings and thank the holy architect who created them. I would suggest you travel and vacation to New England. That does not include New York which a lot of people mistake. Massachusetts, Ct. Rhode Island, New Hampshire Maine and Vermont are the New England States. There is every kind of terrain there mtns., lakes, ocean, forests, meadows,etc. Our country’s history started there with the pilgrims. You can see where they landed, there is a living settlement of the pilgrims there (Plymouth) further down is Cape Cod known to New Englander’s as “the Cape-whale watching ,deep sea fishing, antiques, unbelievable seafood, pristine beaches further down headed to Povincetown(not the nicest area) Antiques galore in every state, things perticular to that state. The history in Boston, Lexington and Concord is not to be missed. The Revolutionary War, but also in Concord all the authors homes-Orchard House that Louisa May Alcott lived in.Also Emerson, Thoreau etc. homes you can go in; as well as Sleepy Hollow Cemetery where they are buried next to each other on Author’s Ridge. Beautiful White Mtns. you can hike in N.H. Drive up or climb to the top of Mt. Washington highest point of the Appalachian Mtns. Again, tons of antiques (1700’s) esp. in Mass. N.H. Maine and Vermont. Do not miss Western Mass, Tanglewood and tons more. Clambakes on boats in Maine. Maine blueberries depending on time of yr. The Best. Little tart ones.Quilts, quilts, quilts everywhere! A National Seashore Park in Maine(the name escapes me) A wonderful coastline drive through all states. You can’t beat a New England vacation. Too much to list in Boston. Please return to Seattle! Visit Beecher’s Cheese and Glassybaby, the Women’s University Club of Seattle, as well as the Bellevue Botanical Gardens and Kusak Glass Works. Much to see and do here that you have yet to experience! Montana is a wonderful state to visit. Some of our best times have been snowmobiling through Yellowstone Natl. Park in the winter. This summer we are visiting Florida- Destin & Palm Beach. These are both wonderful areas, but different in many ways. We like them both, by Palm Beach is my favorite! Thanks for sharing part of your adventure with us! We spent a week in Montana in June and it was lovely. But the majority of our time was spent in Glacier National Park-absolutely incredible!! Also one of my favorite destinations in the Washington, Idaho, Montana area is the Hotel Davenport in Spokane!! You really should do an article on this wonderful historical hotel built in 1910 right in the heart of Spokane! I just returned from Bozeman, MT also. We must have been there a few weeks after you because temps were in the 70s. Being from Florida, you can imagine how refreshing that was! It was our first time to Montana and the beauty was exceptional. That is too funny!! We went to escape the heat and took it with us. Glad you had fabulous weather. Estes Park, Colorado and Garden of the Gods in Colorado Springs: two of the most beautiful places to visit! Looks like you had a great time! Thanks for sharing! We are headed out to Bozeman in a couple weeks! We have a cabin reserved in West Yellowstone and will be visiting Yellowstone National Park and the Grand Tetons, as well as a rafting trip down the Snake River! I can’t wait! Since we have lived all over the U.S., my favorite vacation spot is Mackinac Island. The Island is beautiful and staying at the Grand Hotel is over the top. Yes, and you can always count on a cool breeze on Mackinac Island. If you can’t make the trip, “Somewhere in Time” (with Christopher Reeve) was filmed at The Grand Hotel and on the Island. This sounds like a beautiful trip, filled with the splendor of nature, and plenty of fun and memories. Our son in law’s brother moved near Bozeman, and loves it there, so it’s on my “go to” list of places to see. We just returned from Yellowstone and the Gran Tetons, as well as Bozeman, 3 forks, Helena and Ennis, MT. What a beautiful part of the country! Thanks for sharing your trip!! I also from Alabama now live in Texas & can vouch for the hot temperatures! !